In the summer of 2013 I relocated from San Diego, CA to Portland, ME. I turned on the radio and instantly fell in love with WMPG's eclectic programming. I became on-air certified in 2014 and started subbing immediately. 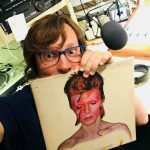 My first chance to make radio was a short-term show called Jazz Odyssey, treating listeners to a mix of hard bop and jazz fusion on Monday nights. Since then, I've regularly rotated time slots and themes, with shows like Sonic Latitudes, Left of the Dial and DJ Shaxx Presents. I currently host Left of the Dial on Wednesday nights (8:30-10). Each week I put together a playlist of eclectic and classic rock & pop from the 70s, 80s and 90s (punk, glam, prog, post-punk, new wave, alternative). My goal is to continually broaden the horizons of my playlists and galvanize listeners' imaginations with great music.